Kia has unveiled its third-generation Ceed Sportswagon, which brings increased boot space to rival models from the next segment up. The Kia Ceed Sportswagon brings boot space of 600 litres with the seats up. 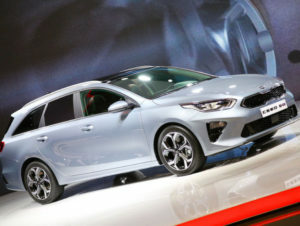 Unveiled at Geneva alongside its hatchback counterpart, the upgraded Optima and the sport-inspired Rio GT Line, the new Ceed is wider, lower and longer than the current model, bringing cargo space of 600 litres – up 72 litres from the current model as well as trumping the Ford Mondeo’s 500 litres – along with a lower lip to aid loading, a completely flat boot floor, 40:20:40 split-fold rear seats and increased passenger space. Options include a Smart Power Tailgate – which opens automatically when it detects the Ceed’s smart key in close proximity to the tailgate – and a luggage floor rail system. Engine range is the same as for the new hatch and brings 118bhp 1.0-litre and 138bhp 1.4-litre T-GDi turbo petrols – with the latter replacing the previous 1.6-litre on offer in various markets – and a 1.6-litre diesel with either 114 or 134bhp. A 99bhp 1.4-litre MPi (multi-point injection) engine will also be available. A six-speed manual transmission comes as standard, while the new 1.4-litre T-GDi and 1.6-litre CRDi engines will also be available with Kia’s seven-speed double-clutch transmission. A Drive Mode Select system brings a choice of Normal and Sport modes. Ride and handling have been improved and bring a new fully independent suspension system, complemented by revised spring and damper rates and a faster steering rack. Equipment includes a ‘floating’ infotainment system available as either a 5.0- or 7.0-inch touchscreen audio system, or 8.0-inch touchscreen navigation system, with navigation and Kia Connected Services powered by TomTom. Driver assistance features include the European debut of Kia’s Lane Following Assist ‘Level Two’ autonomous driving technology, along with Smart Cruise Control with Stop & Go, Blind Spot Collision Warning, Rear Cross-Traffic Collision Warning, Smart Parking Assist, and pedestrian recognition with haptic steering wheel warnings for the Forward Collision-Avoidance Assist system. The Ceed Sportswagon goes on sale across Europe during Q4 2018. UK on-sale date, specification and pricing will be announced closer to the launch.